Testimonials: Do not be afraid when you got cancer, please face it with optimism. SURIANI TJUA, 50 years old now, was diagnosed with cervical cancer in Malaysia in 2013. “I was so scared that I could not say anything. I broke down and knew myself is dying soon.” SURIANI TJUA still felt sad and desperate when reminding the moment she know she got cancer. Fortunately, encouraged by her relatives and friends, she gradually regained her confidence. They told SURIANI TJUA that she still has great hope because the cancer she got is Stage II cervical cancer. Under the encouragement of her families, SURIANI TJUA decided to take cancer treatment in a local hospital. She took 12 sessions of chemotherapy, but she was greatly tortured by the side effects brought by chemotherapy, such as diarrhea, vomiting, poor appetite, hair losing, etc. 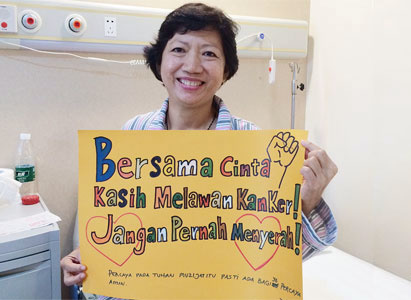 Therefore, she decided to quit chemotherapy and take radiotherapy. Her tumor was under well controlled after taking 28 sessions of radiotherapy. But not for long, she has enlarged lymph node and was suspected to have metastasis to the lymph node, liver and lung. SURIANI TJUA was so afraid of chemotherapy that she refused to take continuing treatment and started to look for better cervical cancer treatment. Occasionally, one of SURIANI TJUA’s friend found Modern Cancer Hospital Guangzhou on the internet and told her to go to the office f MCHG in Jakarta to get free consultation. Learning that Modern Cancer Hospital Guangzhou is equipped with advanced minimally invasive therapies which are of few side effects and quick recovery, compared with traditional chemotherapy, SURIANI TJUA saw new hope of life and quickly decided to take cervical cancer treatment in China. SURIANI TJUA arrived at Modern Cancer Hospital Guangzhou on April 29th, 2015. After a complete physical checkup, the multidisciplinary team(MDT) of MCHG quickly made her a comprehensive treatment plan of interventional therapy, cryotherapy and chemotherapy. At first, SURIANI TJUA resisted to take chemotherapy because she was greatly tortured by the side effects brought by chemotherapy before. Knowing that SURIANI TJUA did not want to take chemotherapy, her attending doctor gave her a detailed explanation that chemotherapy is only a adjuvant therapy, the treatment is based on interventional therapy and cryotherpay. Compared with traditional chemotherapy and surgery, interventional therapy and cryotherapy are of small trauma, few side effects and better efficacy. With doctor’s explanation and consolation, SURIANI TJUA finally took treatment relievedly. She told us that although the treatment also brought few side effects, they were nothing compared to the side effects brought by chemtherapy. To her surprise, her tumor shrank after taking first session treatment here.